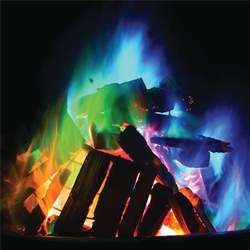 Create magical fires of blue, green and red to your campfire, fire pit or fireplace. Small fire requires 1-2 packs, larger fires 3-5 packs. Can be used on indoor or outdoor fires. Do not cook over colored fires. NOTE: Price is per pack.